Ok, so over at the Moxie Fab World Blog, Cath is hosting a challenge that I just can't pass up...The Chevron Chic Challenge! I'm sure most of you have already seen it and know what it's all about. But in case not, it's all about the trendy trend of Chevron Stripes. You may also be aware of my latest Papertrey Ink stamp set, that I designed, called Background Basics: Chevron Stripes. See... this challenge was made for me to take it on. So, I pulled out my stamps and this is what I came up with... A simple yet trendy single layer card. I used a bright and fun color combo of Hibiscus Burst, Orange Zest, Summer Sunrise, Lemon Tart & True Black. Starting with a Rustic White card base, I stamped two of the Background Basics: Chevron Stripes along the right side of the card base. Here's A Tip: To guarantee perfect placement... 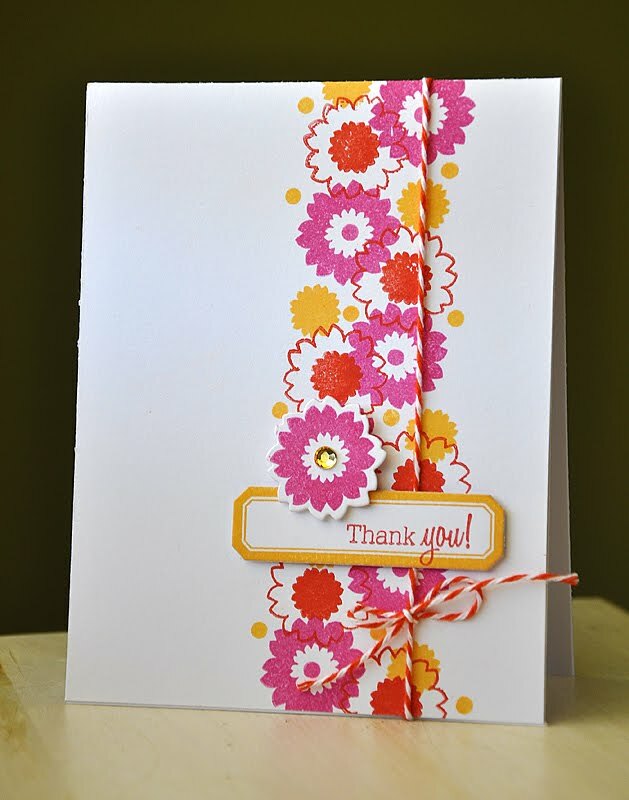 I started by stamping the Hibiscus Burst stripes, in the desired position and then stamped the rest. Pulled out this fun sentiment, from Hero Arts Made With Love sentiment set, and stamped it in True Black. I love how the directions of the sentiment helps to guide your eye across the entire card front. To finish the card, I stamped a butterfly (also from the same Hero Arts set) in True Black and embellished with a few black rhinestones. What fun! I hope you too will take on the challenge. 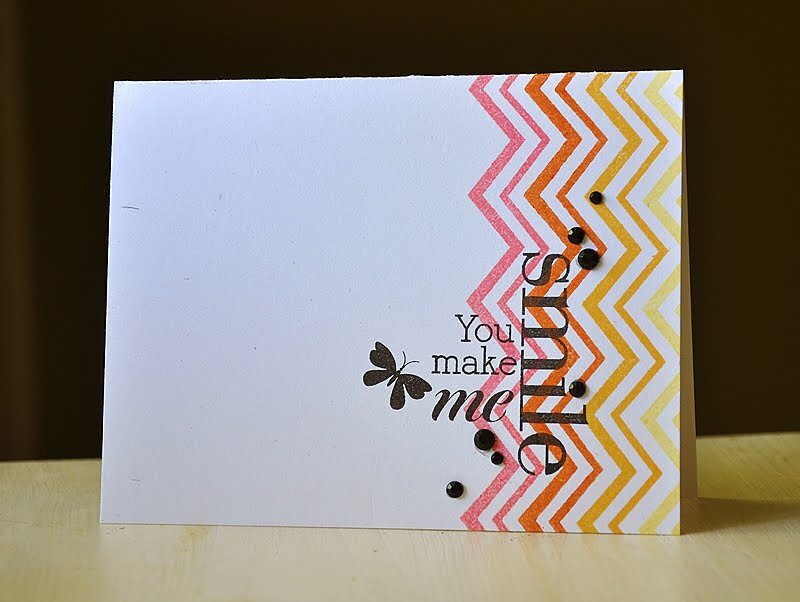 If you do, and happen use your Background Basics: Chevron Stripes stamp set, please share your creation with me. I'd love to see!!! That's it from me today. Have a good one and thanks for stopping by! 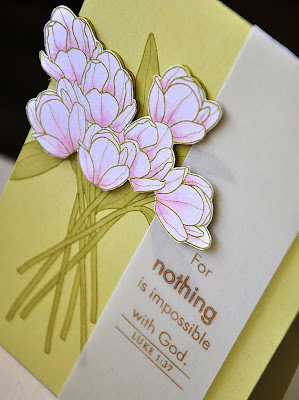 Today is the the day of the Papertrey Ink Blog Hop Challenge, and this months challenge is all about flowers. Thought I would join in on the fun by pulling out my Modern Basics stamp set to create some fun flowers. Here's a card I whipped up just for the challenge... 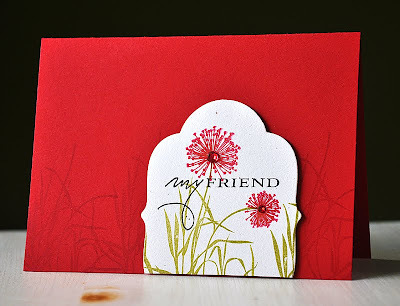 I started by embossing a white card base with the largest of the Turning A New Leaf dies. Next up, I stamped a fun modern flower design using a few of the rounded square images included in Modern Basics. Stamped the largest in Berry Sorbet, medium one in Orange Zest and the smallest in Summer Sunrise. Embellished the centers with rhinestones and mounted them to the card base with dimensional adhesive. 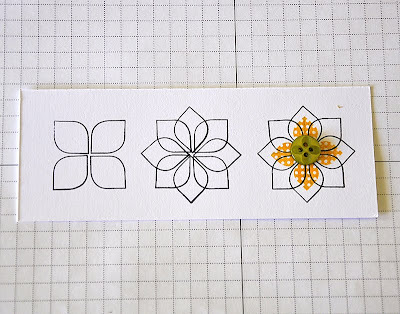 Here's How: (1) I started by stamping the linear square 4 times, to form a simple 4 petal flower shape. 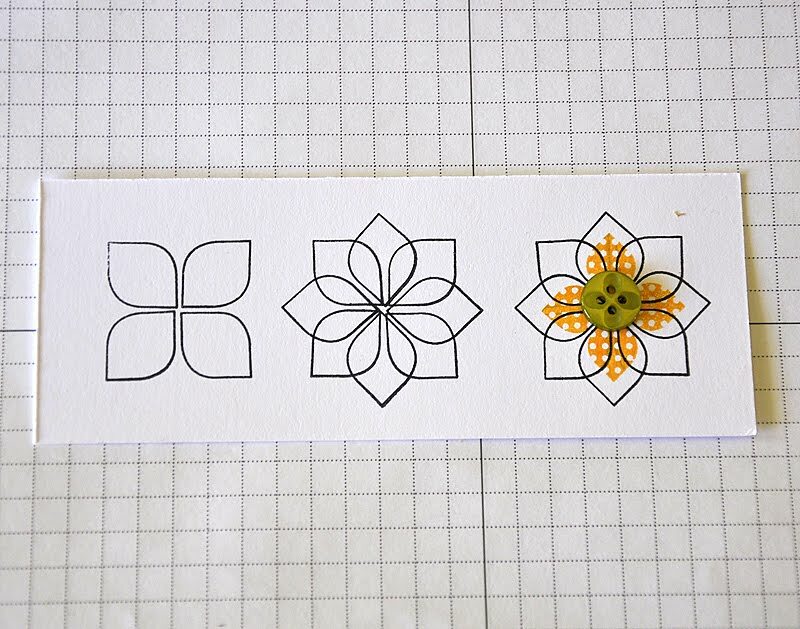 (2) Then stamped the same 4 petal shape again in the opposite direction. At this point you could add an embellishment to the center and call it done. 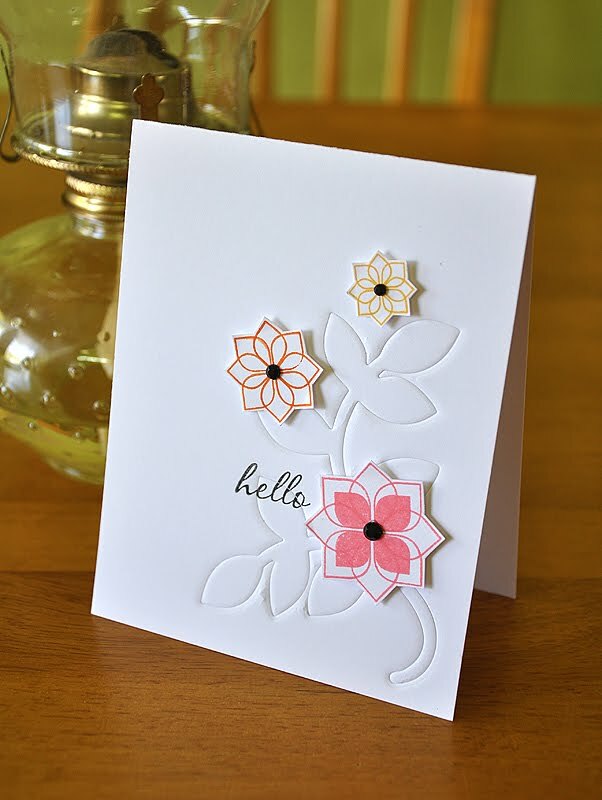 (3) Or you could take it a step further and finish it off with a solid square stamped within 4 more petals, like I did with the polka dot Summer Sunrise image. Then finish it off with an embellishment of your choice and cut it out. That's it from me today, be sure to stop by Nichole Heady's blog for all the Blog Hop details and to see what everyone else came up with. Hello all! Have you seen the new special issue magazine from Paper Crafts yet... Card Creations 9? This issue if full of fabulous and inspiring creations. I've already gone through my issue, front to back, a few times. You can get yourself a copy here. I have a few cards featured in this issue. So, I thought I would share a few of them with you today. In case you missed them: Paper Crafts Connection featured my Celebrate This Day card here and Cath featured a couple of my cards on the Moxie Fab World blog, here and here. 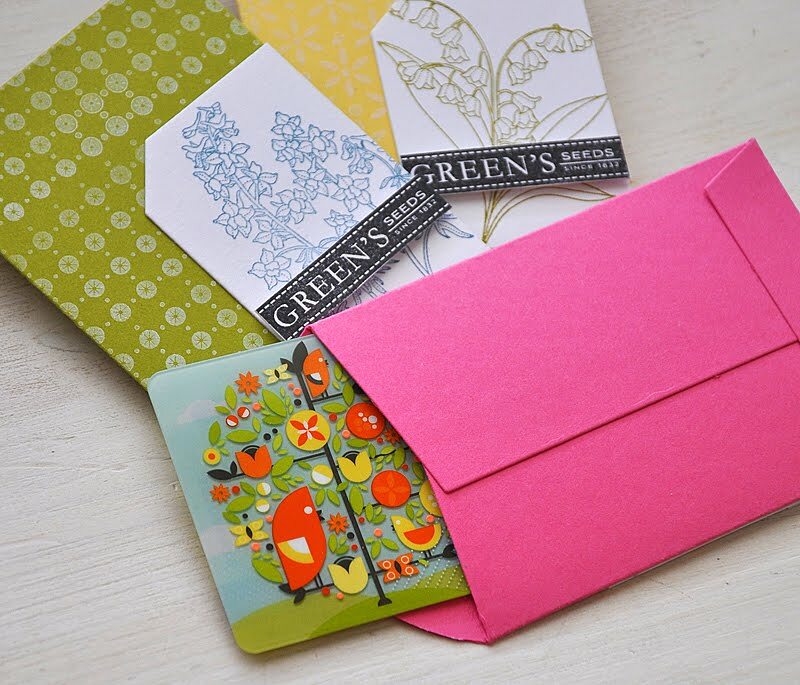 I am extremely honored that Paper Crafts and Cath would feature my cards, but I find it kind of funny that my cards were featured as Vintage and Fun & Cute styles, both are not styles I would consider my self good at. Guess I really need to step out of my box more offten. So, thanks Cath! Starting with a Vintage Cream card base, I stamped it with a wreath from Wreath For All Seasons and a sentiment from Delightful Dahlia, in Rangers Distress Frayed Burlap ink. 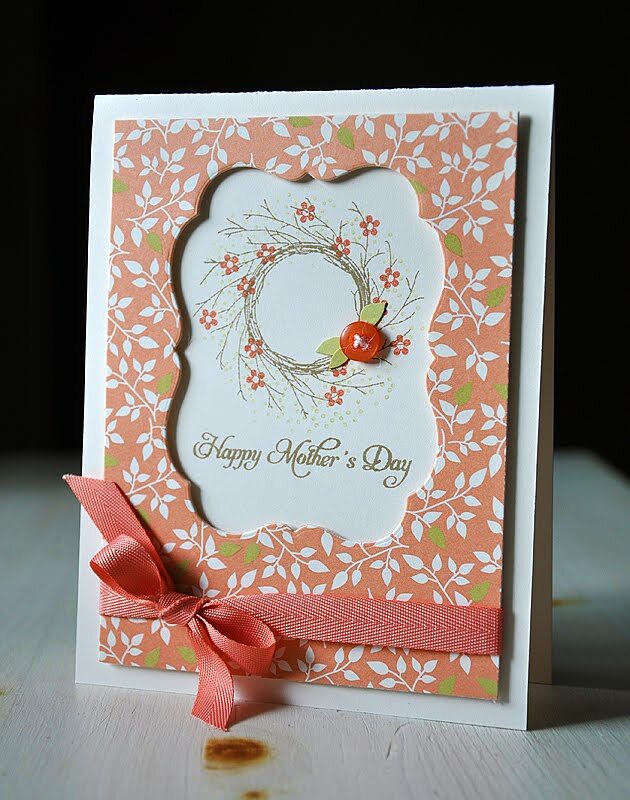 I know that Mother's Day has already come and gone, but by switching out the sentiment you could have yourself a birthday card too. Die cut a Mat Stack #4 from some Green Tea Leaves pattern paper. Wrapped with Melon Berry ribbon and attached with dimensional adhesive. 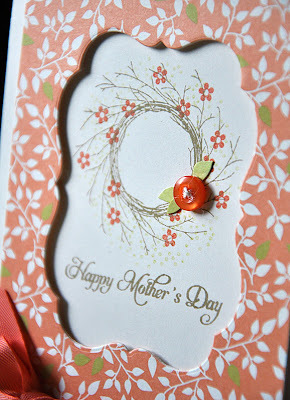 Inked up the wreath dots/berries in Spring Moss, stamped off on scrap paper and then stamped over the wreath. This gave the dot/berries a lighter impression. Randomly stamped the tiny flower in Melon Berry and then finished the card off with a Melon Berry button, twine and a few hand cut Spring Moss leaves. I love how these hand cut leaves play off of the green leaves found in the pattern paper! 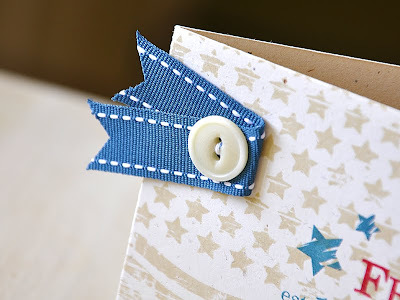 Also, have you seen the latest The Chevron Chic Challenges over at the Moxie Fab World blog. 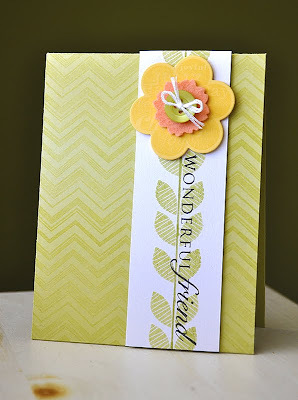 I hope to see you guys pull out your Background Basics: Chevron Stripes sets and join in on the challenge fun! I'm looking forward to seeing what you all create! That's it from me today, I hope you enjoyed! Have a super day! This post is long overdue. 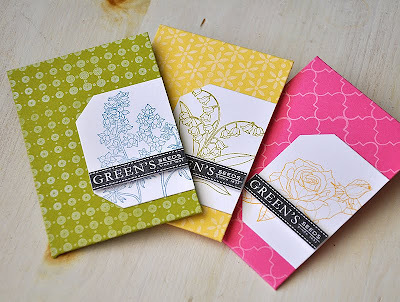 But, finally, here are my creations using the latest 2010 Papertrey Ink Anniversary set... Botanical Silhouettes. If you are unfamiliar with the Papertrey Ink Anniversary set, this exclusive set is one that is not available for purchase. Based on PTI purchases during 2010, customers were able to earn themselves a free set or two. Be sure to keep an eye on Nichole Heady's blog for more info. Using a color combo of Pure Poppy, Hawaiian Shores, Ripe Avocado & True Black. 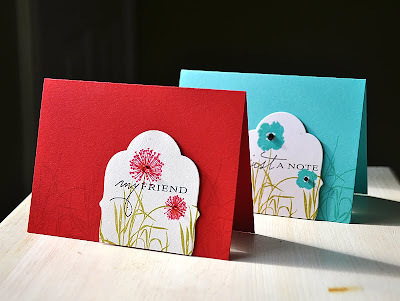 I created two card bases (measuring 5 1/2" X 4") one from Pure Poppy cardstock and the other from Hawaiian Shores. I then stamped each card base with the grouped stem images, along the base, in Versamark ink. To create a focal panel, I started by die cutting a Mat Stack #5 from Rustic White cardstock and trimmed off the bottom edge. Then stamped the grouped stem images twice, along the bottom edge, in Ripe Avocado. Stamped two flowers in the coordinating ink and a sentiment in true black. 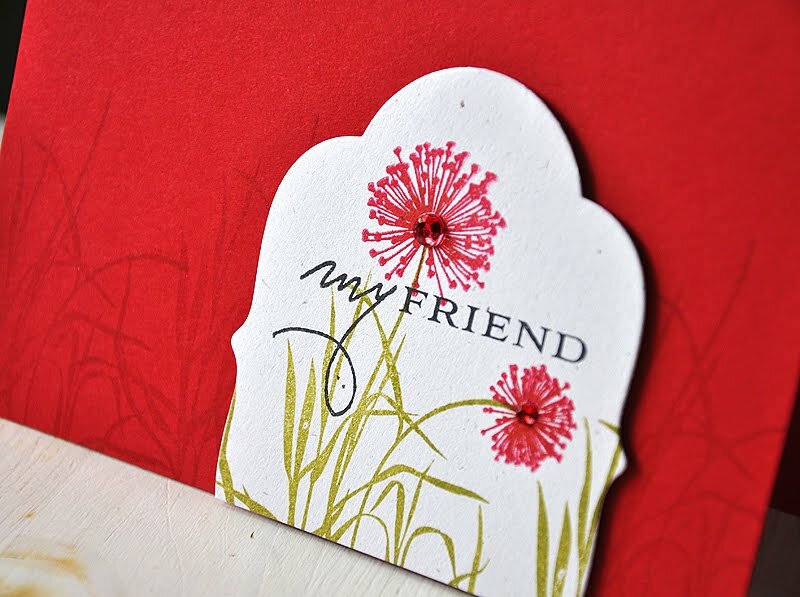 For this Pure Poppy card, I embellished the flowers with a red rhinestone center. 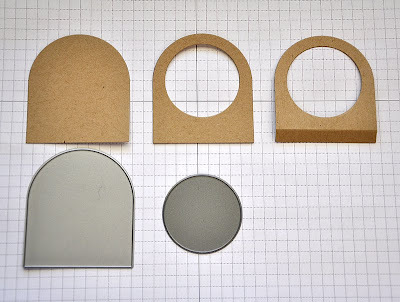 Then attached the focal panel with dimensional adhesive. 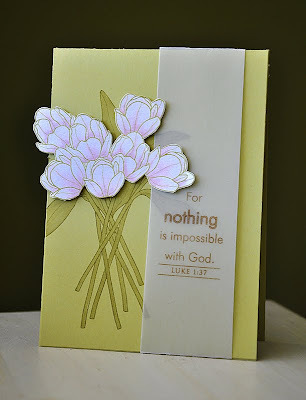 Again, I stamped this Hawaiian Shores card base with the grouped stem images in Versamark ink. 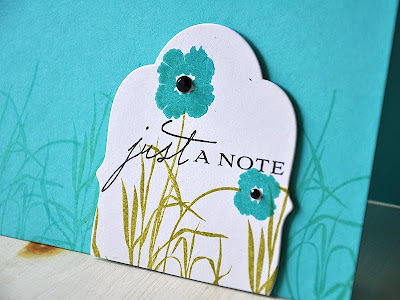 Stamped the flowers in Hawaiian Shores ink and then embellished with black rhinestones. Once I had the design of the first card figured out, the second one came together in no time at all. I'd love to assemble an even larger set of these cards, creating a whole rainbow of colors! Anyways, I hope you've enjoyed this peek at this exclusive Anniversary Set. Thanks for stopping by! Hi! I'm back with the rest of my Papertrey Ink May Release projects. Today I bring you a selection of boy/masculine cards.... First up, a patriotic card using Est. 1776 by Tiffany Pastor. 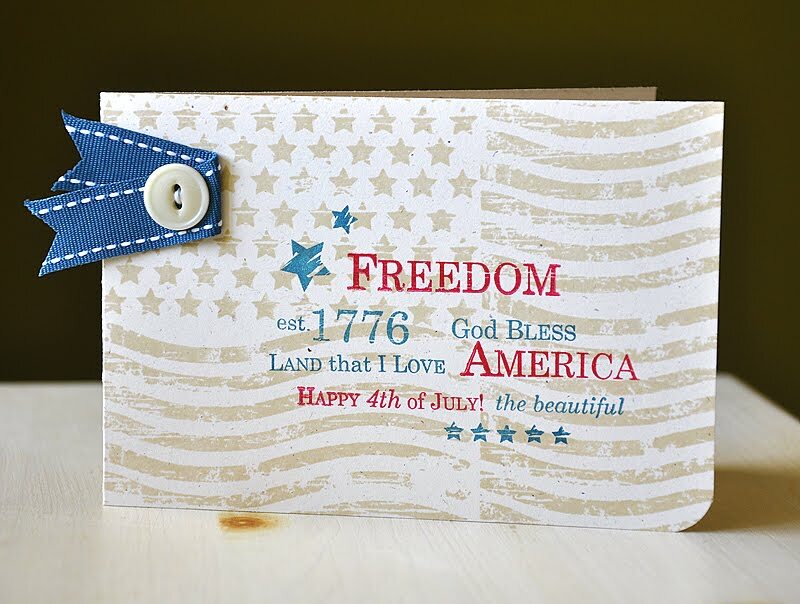 Stamped the card base to mimic the American flag (in Chai Vintage Touch ink) and then grouped all the sentiments in Enchanted Evening and Pure Poppy inks. Finished it off with a ribbon/button flag embellishment. How about a sweet baby card?! 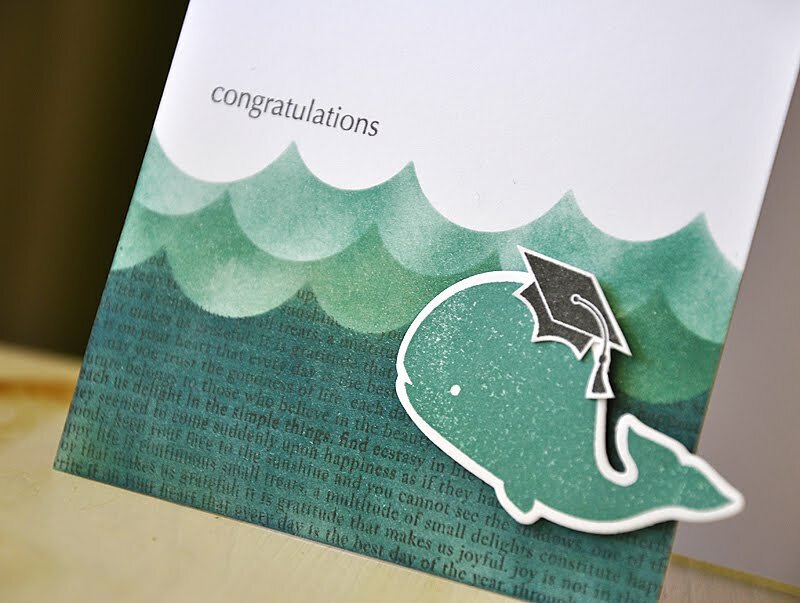 Using Whale Wishes by Dawn McVey. 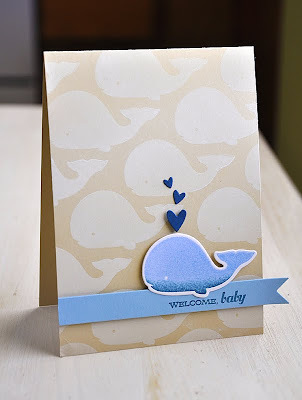 I completely covered the Fine Linen card base with this adorable whale image. 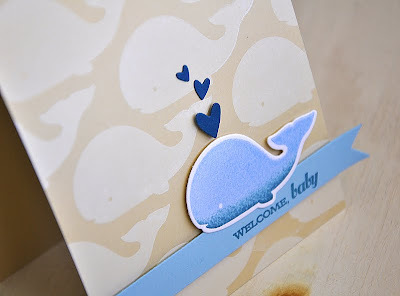 Used the Rock & Roll technique when I inked up the whale, using two different blues, and topped him off with some tiny hearts. 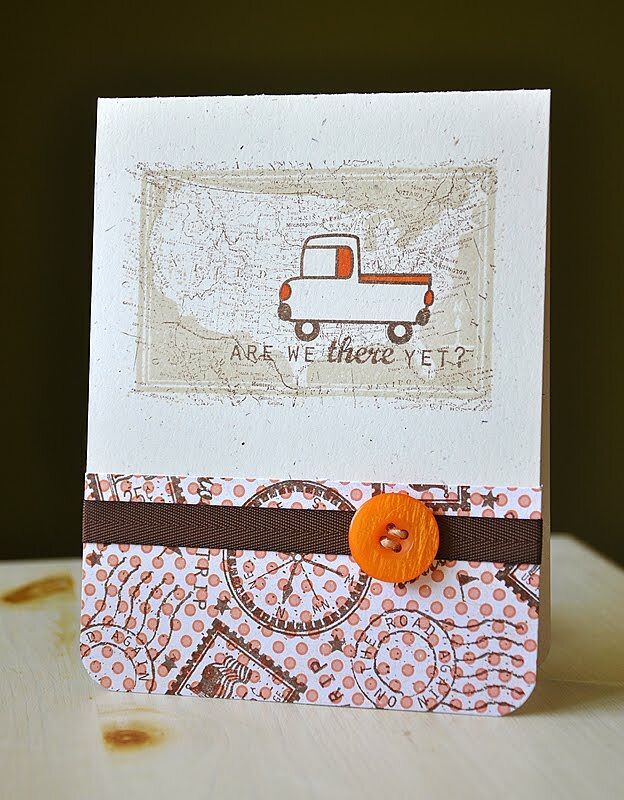 How about some Road Trip stamps and pattern paper by Heather Nichols?! 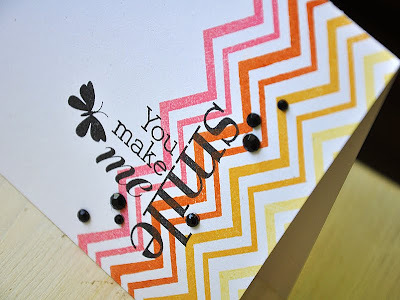 I combined the two to create a unique pattern paper which I placed at the base of the card front. I then pulled out Boy Basics: Truckin' It and did some masking when stamping this map. Started by stamping the solid map in Chai Vintage Touch. 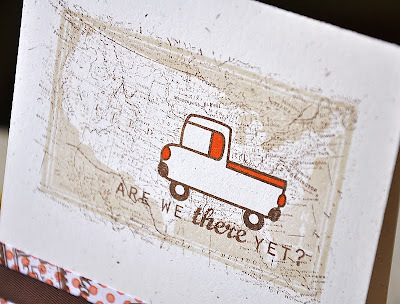 Stamped the sentiment and truck in Dark Chocolate, colored with markers and then placed a mask over the truck. Finished it off by stamping the map overlay in Dark Chocolate and peeled off the mask. Last, but not least, Tag-its #4 by Heather Nichols. 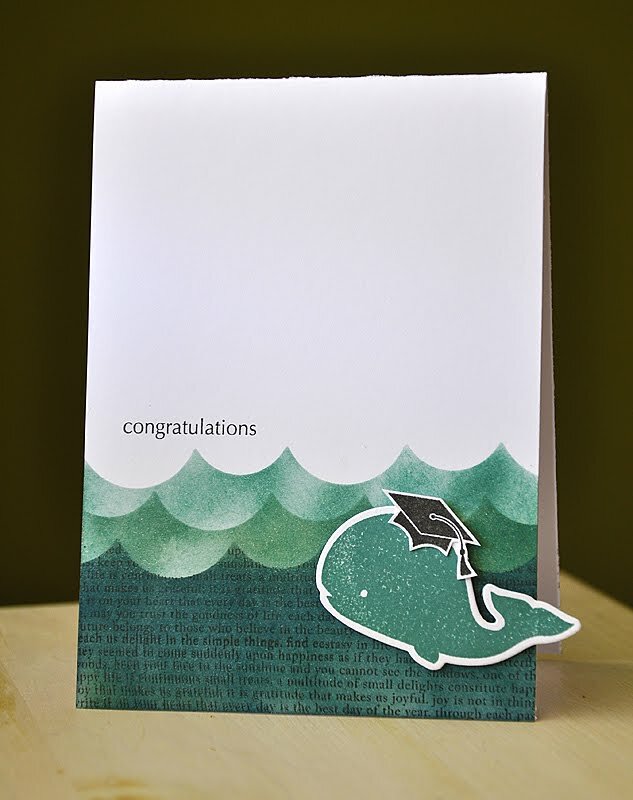 I used the grad cap along with the whale from Whale Wishes. 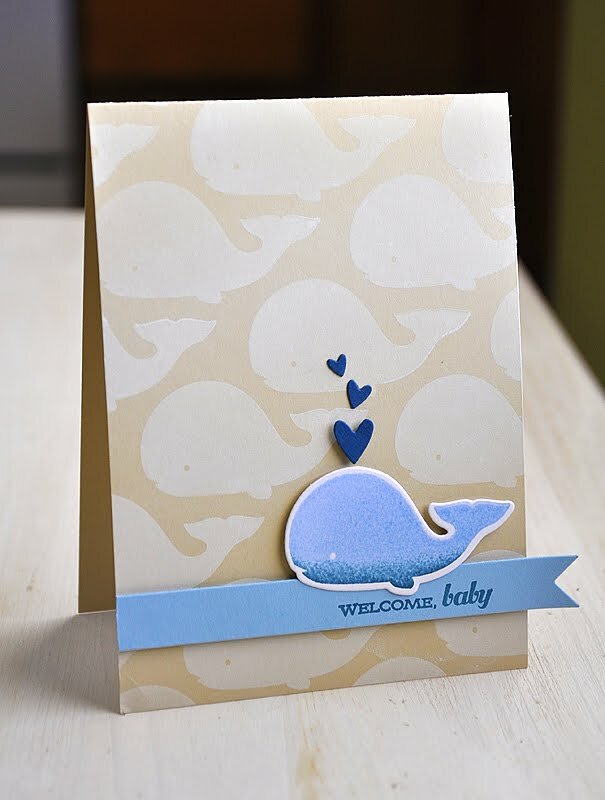 Create a few ocean waves by masking and inking with the Simple Circles Border Die. So there you have it, I hope you've enjoyed the goodies from yet another fabulous release! I'd love to hear what you all are looking forward to receiving the most from this months release! Can't wait to see what you create! Since the Papertrey Ink May release is over, I've got a bunch of cards to share with you. So, for today let me share just a few and I'll be back tomorrow with the rest... First up a simple number using Nichole Heady's Wonderful Words Additions and a Wonderful Words Die. I combined the die with Background Basics: Text Style to create a negative die cut strip, then wrapped it with a vellum sentiment strip. Next up, Beautiful Blessings, an amazing sentiment set also created by Nichole Heady. 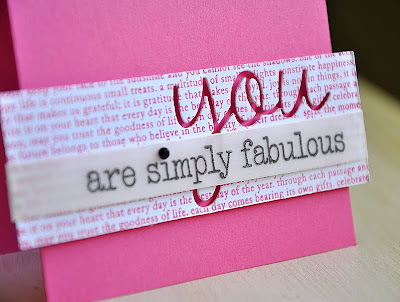 Again, stamped the sentiment onto a vellum strip and wrapped it around the card. 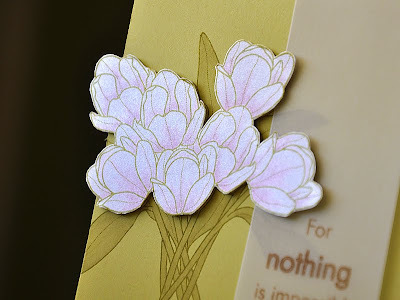 Using the tulips from Freindship Jar Spring Fillers, I stamped it onto both a Spring Moss card base and White Shimmer cardstock, for the flowers. Colored both with Copic Markers. Check out the shimmer on those tulips. Love it! 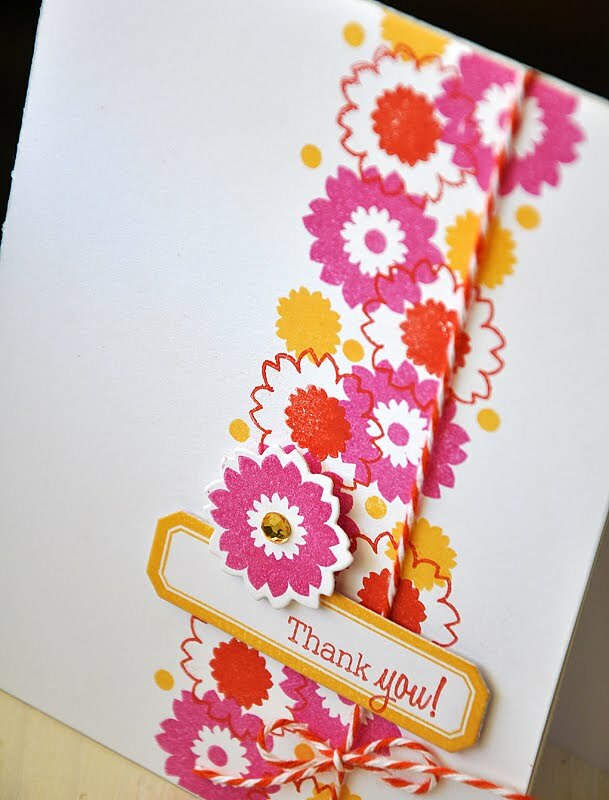 And finaly, this colorful creation using Wildflower Garden by Heather Nichols. Stamped the stems in a color combo of Terracotta Tile, Raspberry Fizz, Summer Sunrise & Hawaiian Shores. That's it from me today. Thanks for stopping by and have a great one! It's the final day of the Papertrey Ink countdown and our second design team group post day. This time around we bring you samples of the entire Garden Variety line-up as well as Year of Flowers Collection stamp set. Garden Variety is a concept developed by Melissa Phillips, and this set stays true to her gorgeous style and heartwarming sentiments. Year of Flowers Collection is a compilation of the entire Year of Flowers series, turned into miniatures. They are just too cute! Both of these set will be available tomorrow (May 15th), but for now be sure to visit Nichole Heady for all the details on both these fabulous stamp sets. Today's card all started with these two tool images, love them. 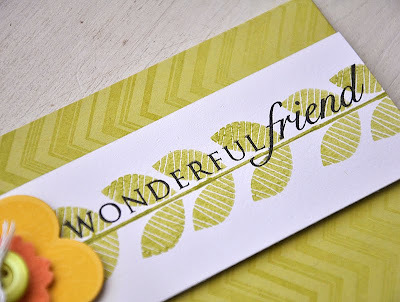 I attached both tools onto my acrylic block, in opposing directions, and hand stamped a repeating pattern in Fresh Snow ink onto a Fine Linen card base. And this frame, it's TO. DIE. FOR! I chose to work with it as a frame for this heartwarming and touching sentiment. 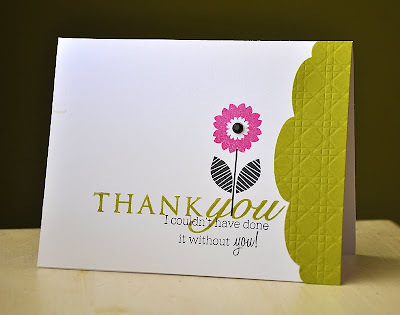 I stamped the sentiment in True Black directly onto the card base (once my Fresh Snow ink was nice and dry). 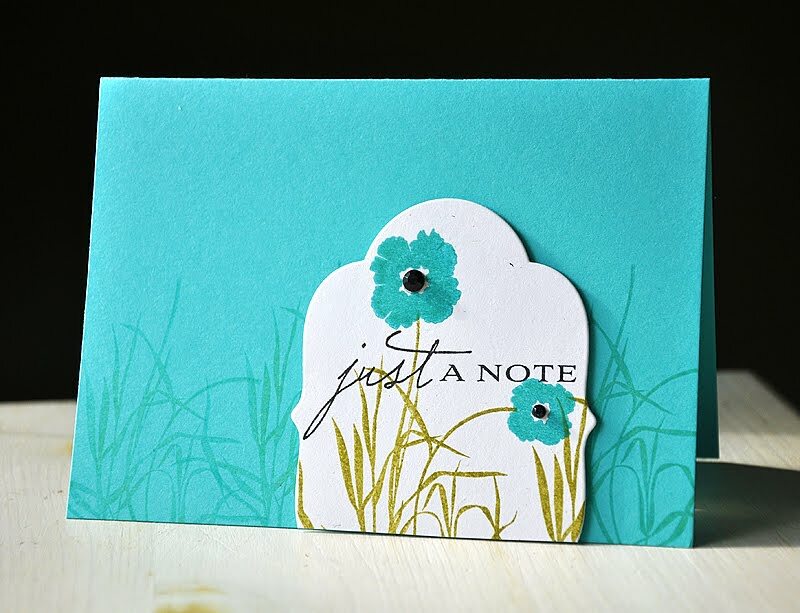 I decided to add a little more detail within the frame and stamp the flower stem filler below the sentiment and add a tiny heart (from the butterfly die included in the Love Lives Here Die Collection). I die cut the frame from Rustic White cardstock, stamped the frame image in Ripe Avocado and mounted it onto my card base with dimensional adhesive. To finish I wrapped it all up with some Fine Linen twill ribbon (my most favorite ribbon by the way!). 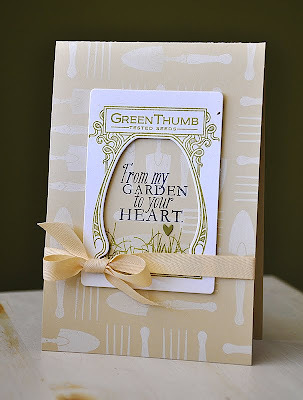 How about a few fun seed packets using the Seed Packet Die?!... I went for a modern approach for this idea and started by die cutting seed packets from Simply Chartreuse, Harvest Gold & Hibiscus Burst cardstock. I then assembled the packets and stamped the front of each one with a few background images (Background Basics: Twinkle, Background Basics: Tin Types & Background Basics: Retro) in Fresh Snow. 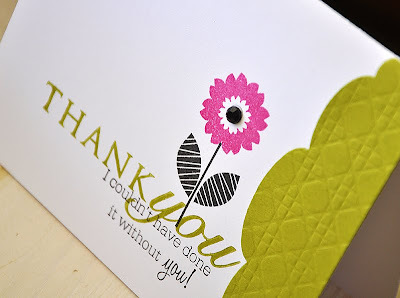 I then die cut and trimmed an angled label, from the Angled Label Die Collection. Stamped each with an images from Year of Flowers Collection and attached to the seed packet. 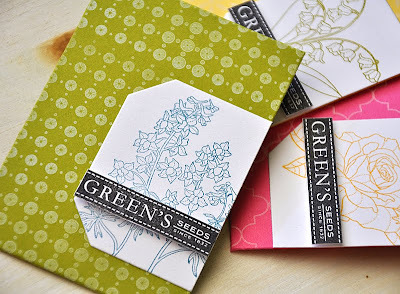 Then finished each packet off with a stamped and trimmed "Green's Seeds" strip. Here's An Idea: These little hand made seed packets make the perfect gift card holders! Well, that's it from me today. I hope you've enjoyed my take on these already well loved sets! Now be sure not to miss the rest of the happening for today. Stop by and check out what the rest of the Design Team has been up to. I'm sure you're in for a delightful time, if you haven't stopped by yet! Hello and welcome! Today is day 4 of the Papertrey Ink countdown and it's time for the first group post. 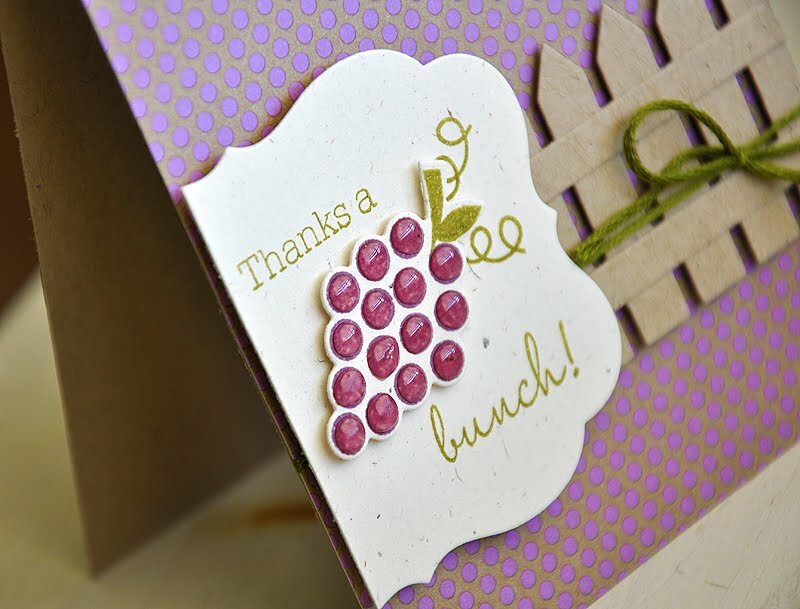 This means all of us on the design team get to showcase the Fruit Fusion stamp set and die series, designed by Melissa Bickford. This series consists of a variety of adorable fruit images and we've all chosen a single fruit to work with. Be sure to visit Nichole Heady's blog for all the details on these $5 sets. 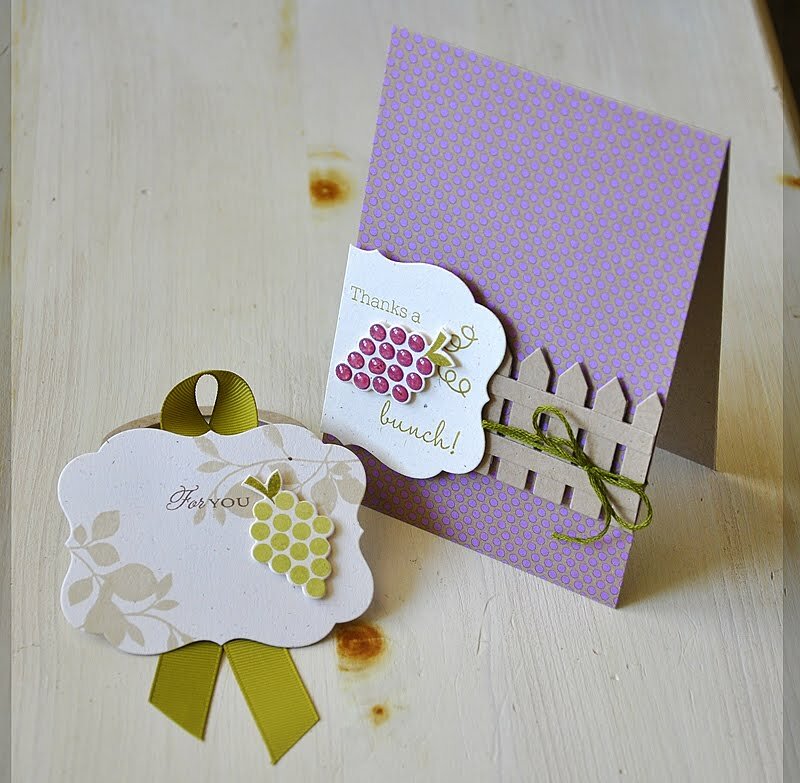 To incorporate the grape into today's projects, I've come up with a grape and wine Thank You set, which includes a card and a bottle tag. 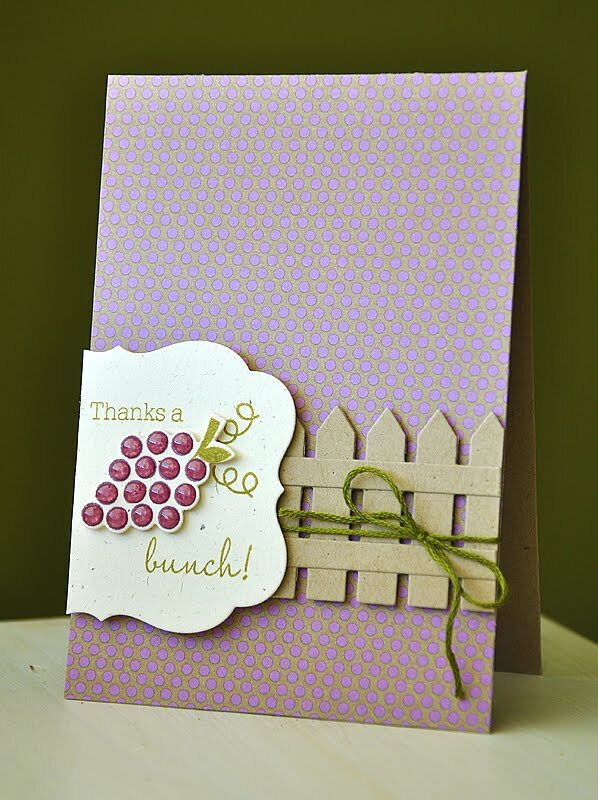 First up a juicy grape card, I just love these luscious grapes! Aren't they cute?! To start, I covered a kraft card base with a bit of Dotty Biscotti pattern paper. Then attached a strip of a die cut picket fence, using the new Picket Fence die (available this month on the 15th). Then wrapped the card base with green embroidery floss. Die cut a Mat Stack #4 from Rustic Cream cardstock, stamped the sentiments, attached and trimmed along the cards edge. Die cut, stamped and attached the Plum Pudding grapes. For a more realistic look, I plumped up these juicy grapes with a few drops of Glossy Accents. 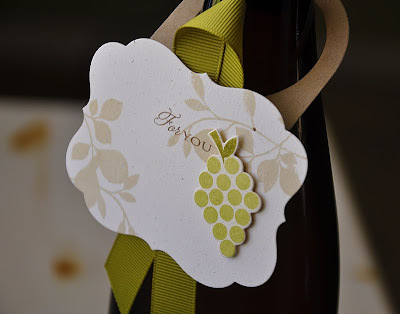 Keeping with the grape theme, I created a bottle topper using a couple of Papertrey Ink dies. This bottle topper fits any wine, sparkling cider or non-alcoholic beverage bottle and it's a simple way to present or dress up your gift. 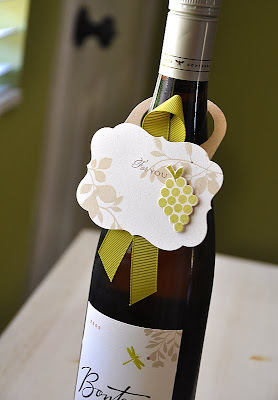 Here's How: To create the loop that hangs the tag from the neck of the bottle I started by die cutting the frame die, from the Sending You Die Collection, from kraft cardstock. 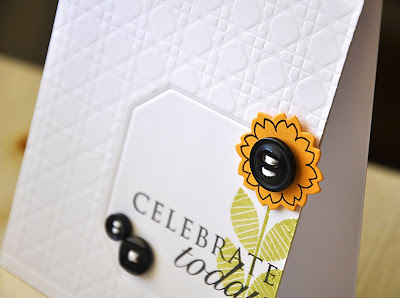 Next, cut a circle from within the rounded top, using the circle die from Limitless Layers: 1 3/4" Circles Die Collection. Then finished by scoring a line 1/4" above the bottom edge and folded. This fold allowed me to attach my embellished tag. Created the tag by die cutting a Mat Stack #4 from Rustic Cream cardstock. Using Chai from the Vintage Touch Ink Duo I stamped a few leaves, from Turning A New Leaf, in opposite corners. 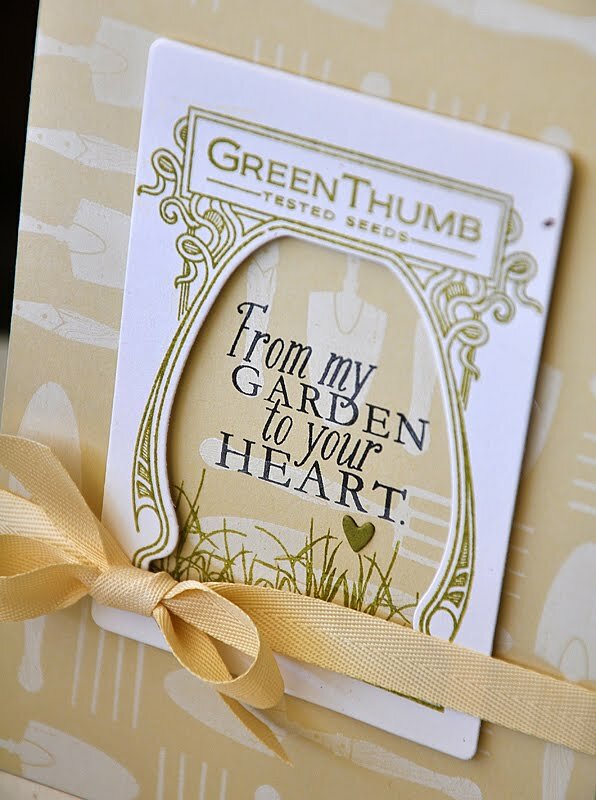 Stamped a sentiment in Dark Chocolate and attached a bunch of green grapes stamped in Spring Moss and Ripe Avocado. Attached a loop of Simply Chartreuse ribbon to the back side and then attached the entire Mat Stack tag to the cardstock loop (I made above). Well, I hope you've enjoyed this look at the new Fruit Fusion: Grape set. This set may not be your favorite of the series, as it is mine, but I hope I have persuaded you to like it a little bit more. Flower Fusion #4 & Think Big Favorites #4, both sets are next in their series and will be available for purchase May 15th. Flower Fusion features a few fun modern flowers and a striped stem. Think Big Favorites features a few super-sized sentiments from last year's anniversary set, Round & Round. Something I seem to say to myself every month, when a new Flower Fusion comes out, is "This has got to be my new Flower Fusion favorite!" and yep this is my current fav from this series. I love this months modern take! 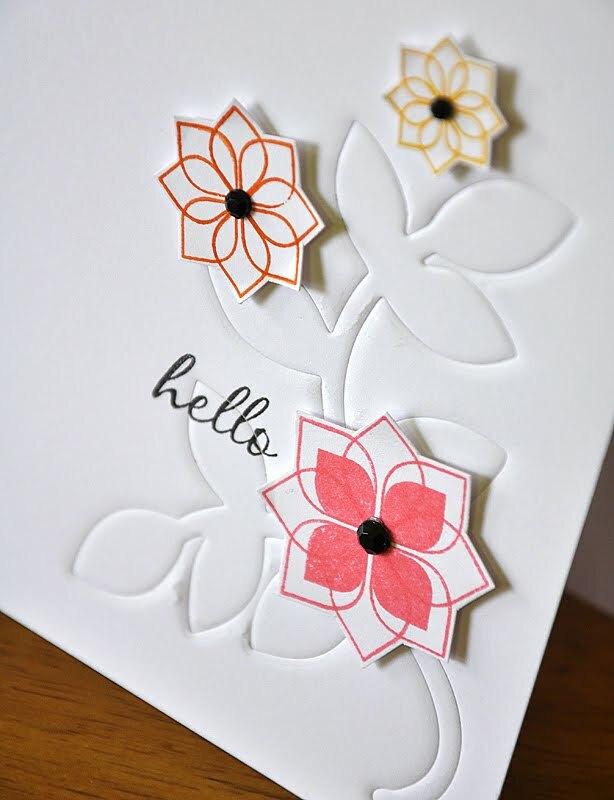 Going with the modern feel of the flower I stamped the stem in True Black onto a white card base and then topped it off with a Raspberry Fizz solid flower. I couldn't get over how well these two sentiments (one from each set) fit together to create the perfect phrase, so I went with it! Stamped the "Thank You", from Think Big Favorites #4, in Simply Chartreuse and the other, from Flower Fusion #4, in True Black. Created a fancy edge using a couple other items also from this release, the Cane Print Impression Plate and Edgers #3 Die Collection. This next card has a bit of a funky and retro vibe. I'm loving this new color combo: Summer Sunrise, Terracotta Tile & Raspberry Fizz. I've been using this combo a lot lately, on some of my magazine submission work. 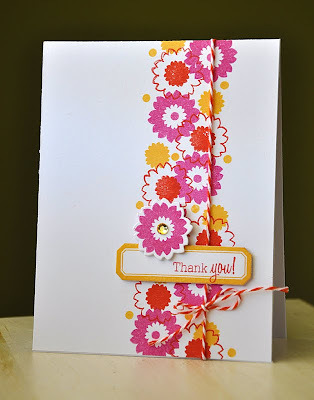 Using all the Flower Fusion #4 flowers, I stamped them in a row along a white card base. The tiny dot is from Flower Fusion #3. Attached a Label Basics label (stamped with a Flower Fusion sentiment) and embellished with a die cut Flower Fusion #4 flower (yep, a coordinating die! ), baker's twine and a yellow rhinestone. 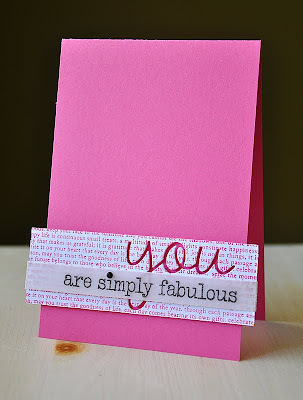 Next up, a card for a special friend that's perfect for any occasion. Started with a Spring Moss base and stamped it with Background Basics: Chevron Stripes in Versamark. Stamped a long stem along a cardstock strip using the technique I featured here (just scroll down a little). Once the ink was dry, I stamped a sentiment from Think Big Favorites #4 along the stem. Created a layered flower using Hello, Friend and it's coordinating Friendly Flower Die, stamped in Versamark onto Harvest Gold cardstock. 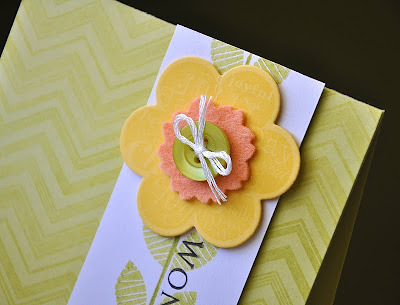 Then die cut a Flower Fusion #4 felt flower, from Melon Berry Felt, and topped it with a Simply Chartreuse button. This last card combines the last two Make It Monday techniques. 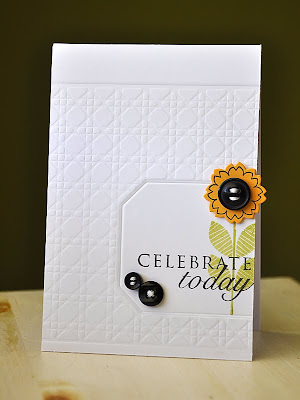 Using the Make It Monday #13 Impression Plate Tricks #2 technique, I carefully embossed my card front using the soon to be released Cane Print Impression Plate along with one of the Angled Labels Dies. 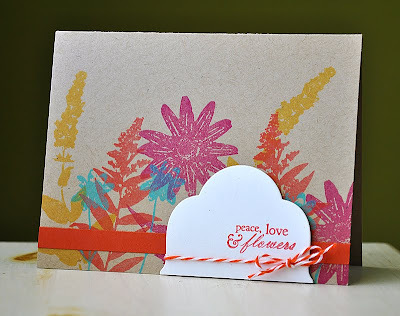 Within the embossed opening, I stamped the Flower Fusion #4 stem twice in Spring Moss. I then stamped this single lined sentiments, from Think Big Favorites #4, into a two lined sentiment using the latest Make It Monday #14: Selective Inking technique. Finished the card off with another die cut flower and a few True Black buttons. Well, I hope you've enjoyed today's samples of Flower Fusion #4 & Think Big Favorites #4.